For the 19th time in NBA Finals history, a champion will be decided in a winner-take-all Game 7 as the Warriors host the Cavaliers on Sunday. The Cavaliers have survived two elimination games to become just the third team to force a Game 7 after trailing 3–1 in The Finals. Can they be the first to finish the rally and win the championship? Or will the Warriors find a way to bounce back and defend home court, where they are 50–4 during the regular season and playoffs, to win back-to-back titles? 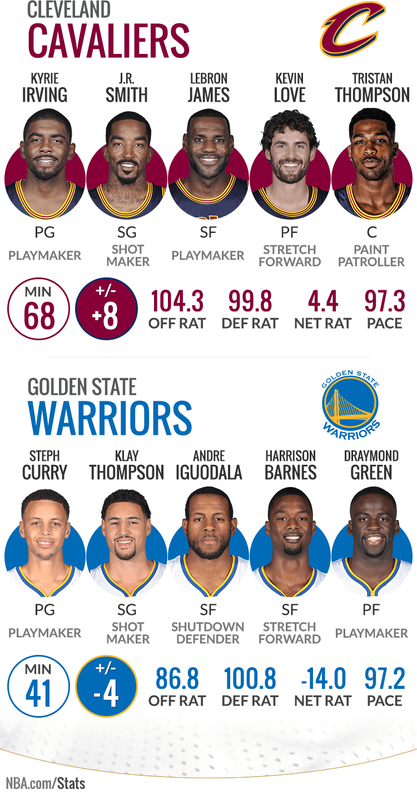 One of the most heralded lineups throughout the year was Golden State’s combination of players dubbed “The Lineup of Death.” Through the first six games, this lineup has barely been able to muster up any potency against the Cavaliers. The Cavaliers have stifled this lineup by holding them to an offensive rating of 86.8 points per 100 possessions. This low number, combined with allowing 100.8 points per 100 possessions, gives them an abysmal net rating of -14.0. With Andrew Bogut injured, the Warriors will have to continue to play small and hope that this lineup can regain their pre-Finals form. Although the Cavaliers have not had too much contribution from their bench, the starters have more than held their own. With LeBron and Kyrie doing the heavy lifting, the team has flourished with Tristan Thompson grinding down in the paint and Kevin Love and JR Smith spacing the perimeter. In 68 minutes, this lineup has played to a net rating of a positive 4.4 points per 100 possessions. Look for Tyronn Lue to lean on his five best players even more than normal in the pivotal Game 7. The old cliché that “Defense Wins Championships” has looked prophetic through six games of the NBA Finals. 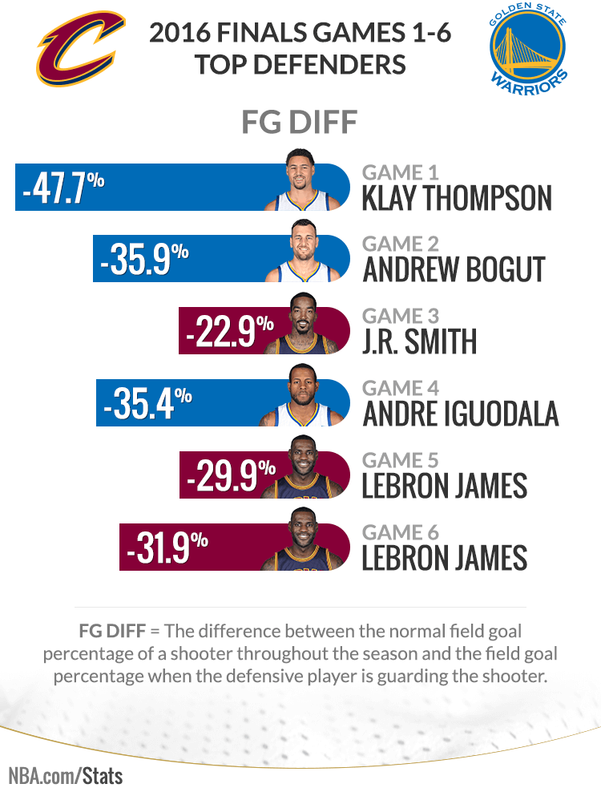 In each game, the player with the best defensive field goal differential saw his team emerge victorious (among players that have played at least 50 minutes during the Finals). The Warriors had a new player step up in each of their three wins this series, while LeBron James led the way for the Cavs on the defensive end in both their Game 5 and Game 6 wins. A key part of the Cavaliers keeping the Warriors’ potent offense in check has been the defensive intensity of Tristan Thompson. Among the 13 players to play at least 100 minutes in the Finals, none have a defensive rating better than Thompson’s 99.2. Thompson’s athleticism has allowed the Cavs to switch more of the Warriors notorious pick-and-rolls during the series and the Cavaliers center has been up to the task. Thompson has held opponents to 32.4% (11–34) shooting on attempts from beyond the arc. No other big man has contested that many three-pointers in the Finals. 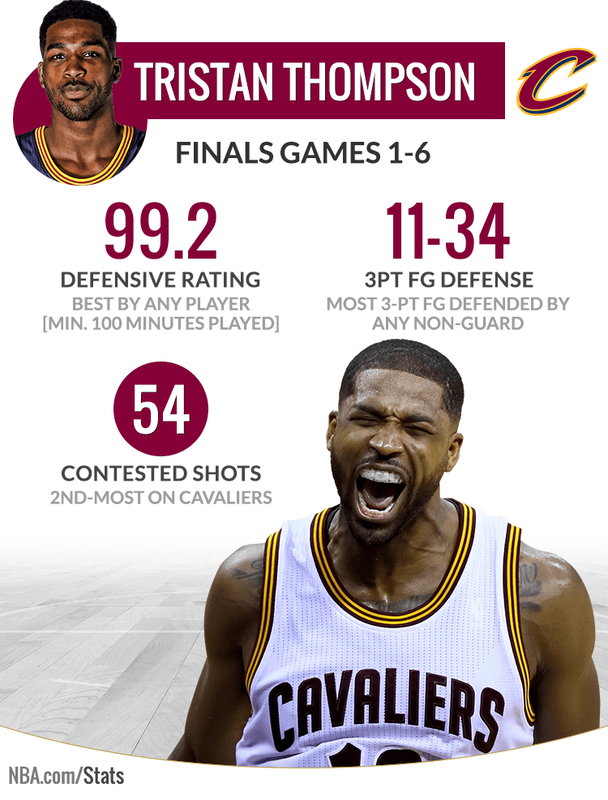 His activity on and off the ball has allowed Thompson to contest 54 shots this series. Only Kyrie Irving (56) has contested more attempts for the Cavs during the Finals. LeBron James and Stephen Curry have won four of the last five league MVP awards and are meeting with the championship on the line for the second straight season. 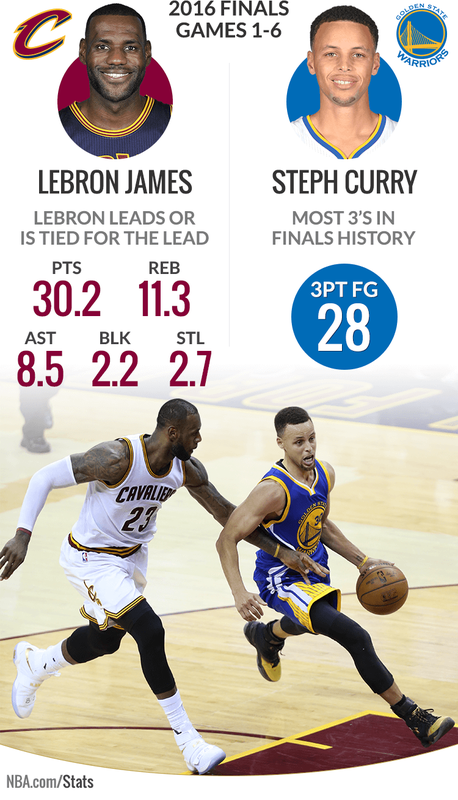 Each player has made a record-setting mark on these Finals — Curry with his 3-point shooting and LeBron with his all-around brilliance. Curry, who shattered his own record for 3-pointers made in a single season this year (402), now owns the record for most 3-pointers made in a single NBA Finals (28). Entering this year’s playoffs the record for most 3-pointers in a playoff series was 28, held by Ray Allen and Dennis Scott. Curry and Klay Thompson both eclipsed that mark in the Conference Finals with 32 and 30 triples, respectively. Can Curry catch fire in Game 7 and break that mark as well? Meanwhile, James’ brilliance has not been confined to one aspect of the game. The load that LeBron is carrying for the Cavaliers is unprecedented, even topping the incredible series he had in last year’s Finals. For the first time in Finals history (since steals and blocks became official statistics in 1973–74), one player is either leading or tied for the lead in all five major statistical categories — points, rebounds, assists, steals and blocks. After averaging 41 points, 12 rebounds, 9 assists, 3.5 steals and 3 blocks in the last two games to help Cleveland force Game 7, what does LeBron have in store for Game 7? Of the 32 teams that have faced Finals 3–1 deficits, the Cavaliers become just the third team to force a Game 7. In order to buck the trend set by those two teams, the Cavaliers will need to win this legacy-altering game. While the Cavs have already surmounted the 3–1 deficit, they still face the uphill climb of winning on the road. 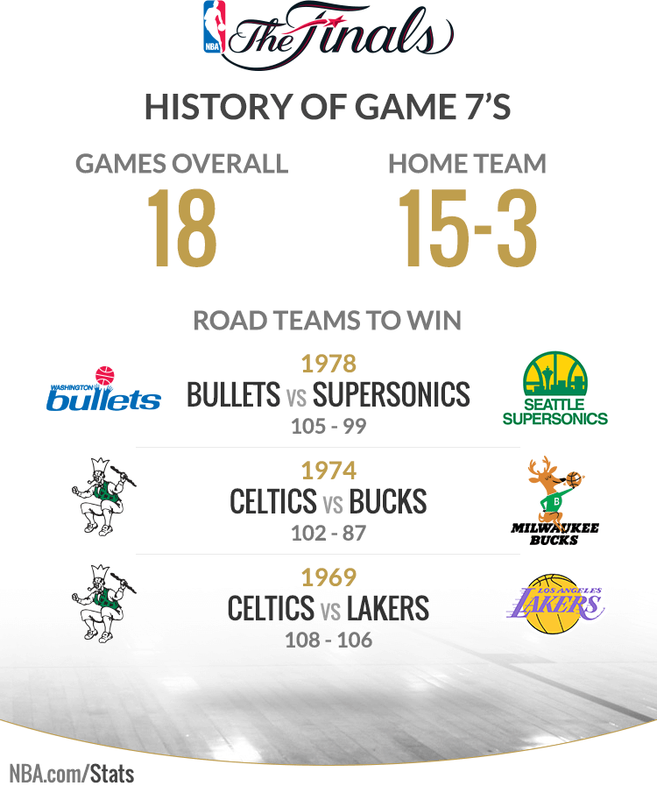 Teams who play Game 7 at home have an imposing 15–3 record, with the last road win coming in 1978. With the Cavs looking to become the fourth team, the Warriors have not only their strong record at home, but also this daunting history on their side.